I don't know what is wrong with me this week. I have all these things to post about, but I am not posting... Then, I only just finished reading something today. I feel like I am not accomplishing anything! My to-do list scares me, so I am ignoring it. Then, on Monday the cc's dad is having surgery and we are going to stay with them for a couple days until there is a bit of a routine. Or, longer if they are not getting by okay... I was hoping to still have things happening at the blog even if I am not around, but that is not turning out so well. The House at Riverton by Kate Morton - It's official, I love her! I think I enjoyed The Forgotten Garden a bit more, but for a first novel this was awesome! It is perfect in atmosphere for the R.I.P. challenge. She is also an Australian author and I am supposedly participating in the Aussie Author Challenge. I am almost done, so I am looking forward to seeing how everything plays out in the end. 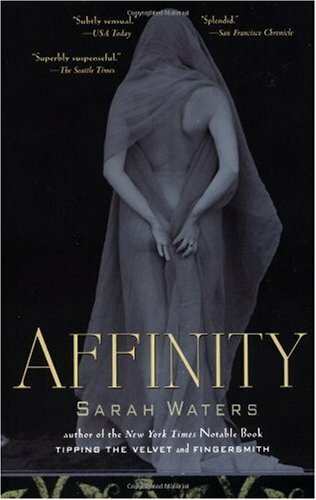 Affinity by Sarah Waters - The first book I ever read by Sarah Waters was The Night Watch. I knew nothing about the author, but I enjoy books set during WWII. Then, I did some research and discovered she is actually rather famous. That lead me to reading Fingersmith by her, loving it, and then promptly buying everything else she has written. It has been a while since I read anything by her, but I am so happy to be diving in again. This book is really good and I am very curious about how it will end. I have theories! 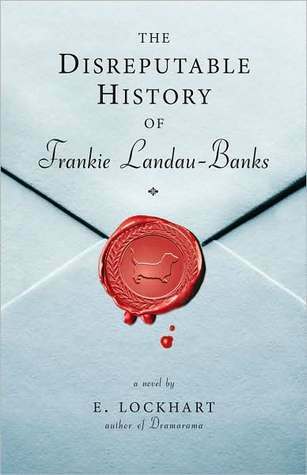 The Disreputable History of Frankie Landau-Banks by E. Lockhart - I am doing very badly with my lists for the Great Reading Swap, but Ana wanted me to read this book. I have had it out from the library about 5 times this year, started it a couple times, but am only getting into it now. It is a fun book and worth the read! I am glad I managed to get to it and will also be finishing it up soon. The Digging Crew by Nathalie Mallet - I am supposed to be reading Interview with a Vampire, but I just don't like it. I went to pick it up the other night, but wound up picking this book up instead. Nathalie Mallet is a Canadian author who wrote The Princes of the Golden Cage, which was on my Best of list in 2008 or 9. I read another book by her earlier this year that is a sequel to that favourite, but this is a young adult book. Before I read the third book in the Prince Amir series, I wanted to see what this was all about. If you haven't read Nathalie Mallet, I strongly recommend her! I think part of the reason I am reading this now is because so many people are reading YA and not fantasy novels; so if I can't convince you to read her other books, I am hoping to get you to read this one. It is good so far! Since I am almost done all of these books, that means starting new ones tonight or tomorrow. There is so much that I want to read, so I am curious what I will decide on! Anything you know you are going to read in November? I am hoping to read a bit of WWI and WWII books. I have a huge selection and haven't read much so far this year. Sounds like you're having a great reading week! I really like all of those authors! That looks like a great collection of reads! Isn't it fun when you discover a 'new' author? I love that. The Disreputable History is one of my favorite books, glad to see you reading it. I loved The House at Riverton! I have not read her other books, though I have both on my TBR pile. I'm glad to hear that you enjoyed The Forgotten Garden. I have really enjoyed both The House at Riverton and The Forgotten Garden--glad you did, too! The Disreputable History is one that I haven't heard of previously, but sounds interesting! I've read both The House at Riverton and Affinity and can't wait to hear your thoughts on these. I always struggle to try and decide what to read next...I just have too many books that I want to read and that I can choose from :) Enjoy! Let's do a buddy read! I have this HUGE book called The Spaces in Between (I Think?) set during WWII- did you get a copy of that to review? I hope you liked The Disreputable History of Frankie Landau-Banks! I thought it was a super great book. yay, Frankie! I'm doing horribly on the reading list swaps as well... at this rate I'll have to ask you all for an extra year. I really hope the surgery goes well. Sending good thoughts your way! **rhapsodyinbooks: I have been enjoying them, too! **Trish: I discover too many 'new' authors. It is reading the old ones again that is a problem! **joanna: I really enjoyed The Disreputable History! **TheBookGirl: The House at Riverton was really great! **jenclair: I am looking forward to The Distant Hours now. The Disreputable History was good! **samantha: The House at Riverton and Affinity were both really good! I still haven't entirely made up my mind what to read next, but I have been busy lately anyway. **Aarti: I did not. I have been seeing it around, though. I wonder if it is worth me getting a copy of otherwise? **Kim: I really enjoyed The Disreputable History, thanks! **Ana: I know. I will have to carry some of the reading swap over to next year. There are still some huge books I haven't got around to reading.